LiFe makes the cart extremely lightweight and easy to move. Ultrafast recharge ensures caregiver and cart uptime: A full recharge from full discharge can be completed in about two hours. Long battery ‘LiFe’ minimizes time and cost for maintenance and replacement. 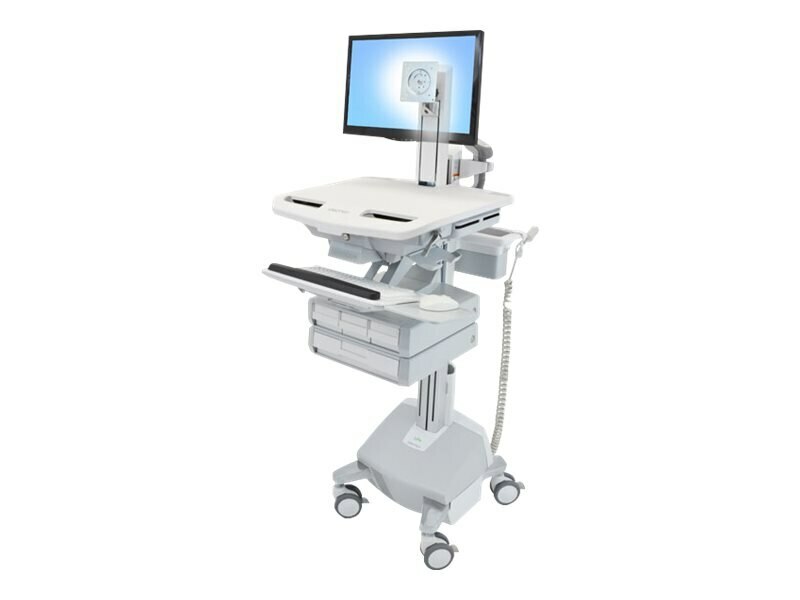 For patient and caregiver safety the entire power system and the FULL cart are certified to UL/EN/IEC 60601-1. Complies with EMI limits of FCC Part 15 Class A.
Max weight capacity of 34 pounds. Includes auto-locking drawer system (ADS), primary triple drawer, supplemental single drawer, drawer dividers, LCD pivot, worksurface, CPU lock, secure CPU compartment, four-port USB hub, scanner holder bracket, mouse holder, wrist rest, back-tilt keyboard tray, keyboard lights, left/right mouse tray, rear handle, storage basket, cable storage, four casters (lockable), single-battery 40 Ah LiFe power system, 10-foot (3 m) coiled cord, AC outlets, power system user interface, StyleLink software.